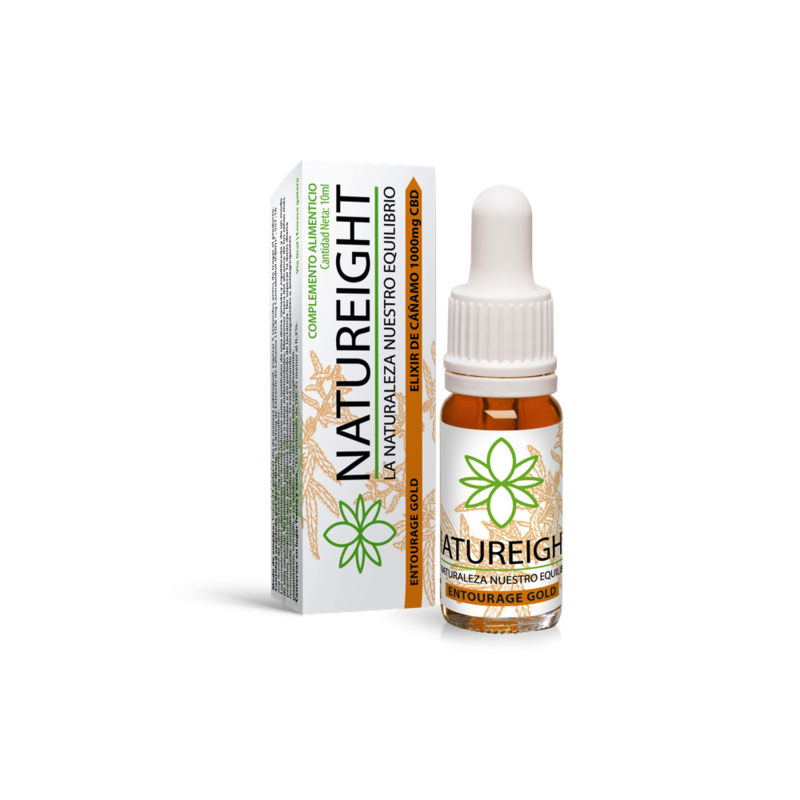 Natureight Elixirs are food supplements made from cannabidiol oil, a natural constituent of the plant Cannabis sativa L. which has no psychoactive effect. This essence comes from hemp plants grown within the European Union, without using pesticides or herbicides, in order to develop a product which is safe and to guarantee the highest quality. Elixirs product line offers you products developed with a full spectrum extract of the plant. Elixirs Entourage are made up of all the essential ingredients of the cannabis plant in order to preserve all its benefits. Elixirs Gold Entourage also preserve them, but they are purified of waxes and chlorophylls in order to diminish the strong taste of cannabis. Natureight products contain various phytocannabinoids, the best known are CBD, CBC (cannabichromene), CBG (cannabigerol) and CBN (cannabinol). It contains also terpenes and other natural molecules such as alkanes, nitrogen compounds, amino acids, aldehydes, ketones, flavonoids, glucosides and vitamins. 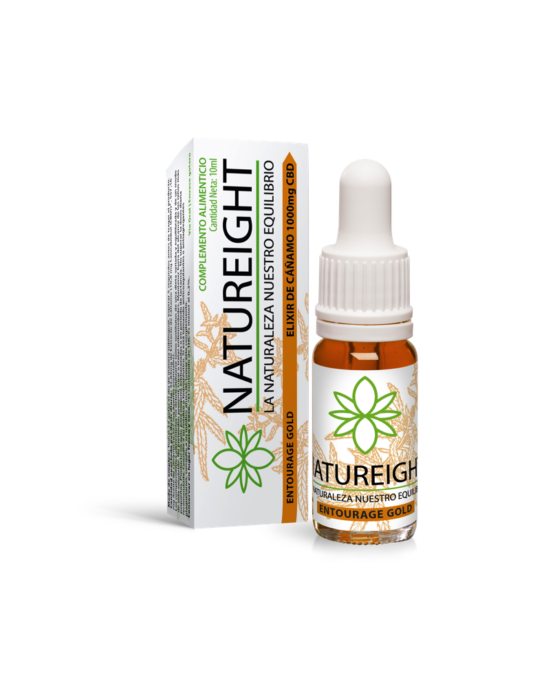 Natureight also adds hemp seed oil for an optimal balance between omega-3 / omega-6. Dietary supplements cannot replace a varied and balanced diet nor a healthy lifestyle. A recommended daily dose should not be exceeded. Keep out of reach and sight of children. Consult your doctor. “Cannabidiol oil, an increasingly popular treatment of anxiety and sleep issues, has been documented as being an effective alternative to pharmaceutical medications. This case study provides clinical data that support the use of cannabidiol oil as a safe treatment for reducing anxiety and improving sleep…”. Natureight distributes its products to countries part of the European Union in 24 to 48 hours. To help calculate the day your package will arrive, count the day the payment was received by Natureight as day 0, excluding week-ends and holidays. However, in some very remote areas, this express service is not offered. In this case, the delivery will usually take 48 to 72 hours. You can contact us by e-mail at info@natureight.com so that we can consult our transportation agency and provide you with a specific time according to your place of residence. You can check the tracking of your package with a tracking number that will be sent directly to your electronic inbox. Natureight covers all shipping costs. For more information, please read the General Sales Conditions. The online payment module will provide you with a step-by-step of the steps to follow. You must enter your credit card number, its expiration date and its CVV security code (the last three numbers on the back of your card). Once your payment is received, we will start to prepare your order. Keep in mind that these transactions are guaranteed by our online payment service provider. If the transaction is denied, contact your bank and ensure that your credit card is enabled to make international payments. If you have any questions about your order, contact us at info@natureight.com. All of our customers have 14 days, after receiving the product, to return it. We guarantee a refund for the price of the products purchased by bank transfer. WARNING: You cannot return a product that has been opened. You must fill out the cancellation form available here and email it to info@natureight.com. You must send us the product and pay for the necessary shipping costs. We recommend that you use the original packaging and the same transportation agency. We do not offer refunds for products that were on promotion.